So did I ever tell you about the time we tried to go to Greece? So after a quick exchange, and a little begging, he realized that Greece was out of the question. But we still had to go somewhere for our anniversary and we still had enough miles to reach the ‘méditerranéen’. I think Rob suggested another location and the response was the same, no free tickets available. So while the travel agent was waiting for Rob to suggest yet another destination, Rob turned the question back to them and asked, which mediterranean islands actually have free tickets available to us? Malta! Mediterranean island, close enough to Italy to boast great cuisine, gorgeous weather, and history as old as time. Our frequent flyer points booked us a five star hotel on the coast with a pool and jacuzzi on the roof. Free international buffet breakfast meant we could sleep in, fill up, and skip lunches in favor of REALLY nice dinners out. We visited all of the historic sites, the blown glass artisan shop, all the churches where the Apostle Paul and his ship wrecked crew taught about Jesus, plenty of beaches, and lots of gelato ice cream. But the highlight of the whole trip was this amazing Italian restaurant overlooking the beach! Four stories of private terrasses with breathtaking views of the setting sun over the water. We ate at this restaurant four times in one week!!! We just couldn’t get over how romantic it was. Perfect for our lovers getaway. And THIS was my favorite dish: Lobster Thermidor. Serve it with fresh prawns over a naturally aromatic rice*. Bring water to a boil in an industrial sized pot. Toss in live lobsters and prawns. Cover and simmer for 15 minutes until the lobster shells are bright red. Cool so that you can handle them. 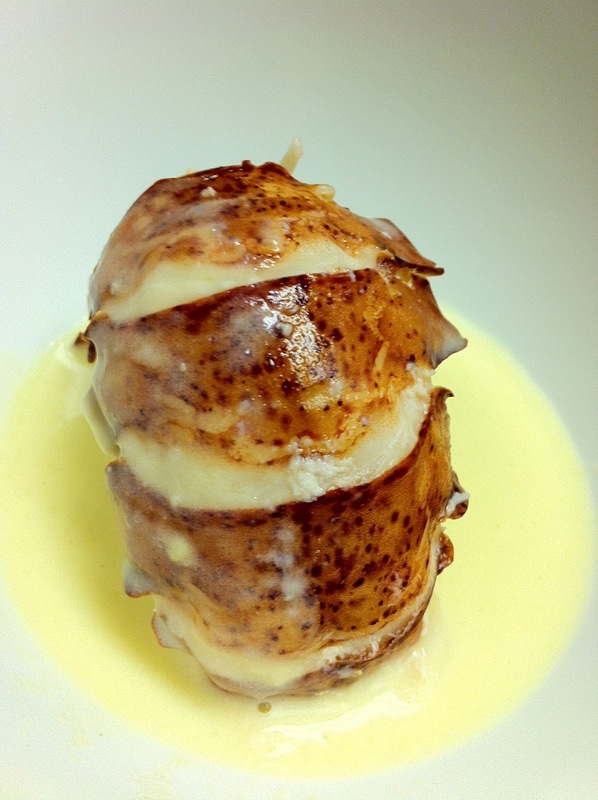 Start by splitting the lobster bodies in half lengthwise through the head and back along the center line of the shell. (#1 – plate) Save the lobster tails and set them aside with the whole prawns until serving time. Reserve the lobster meat from the claws and body and in bite-sized pieces for your sauce. (#3 – trash) Discard the gray sac in the head and the intestinal tube and remaining material in the body. (#4 – pot) Gather up all of the remaining shells and the head for your fish stock. Fish Stock – Pour one inch of water over the lobster shells and add the white wine, bring to boil, and boil briskly until liquid has reduced to 1/2 cup. Milk Infusion – Peel the onion, cut it into quarters, and put it in another saucepan with the peppercorns, bay leaf, thyme, a pinch of salt, and the milk. Bring to a boil. Remove pan from heat, cover with a lid, and allow the milk to infuse for about 30 minutes. Roux – Melt butter in a saucepan, stir in the flour, and cook for 2 minutes to make a roux. Remove the pan from the heat and strain the infused milk and the fish stock through a sieve into the roux. Bring this sauce to a boil, stirring constantly, and cook about 3 minutes until sauce thickens. Add the reserved lobster meat. Allow to cool for 4 minutes, then stir in mustard, egg yolks mixed with a couple of tablespoons of the hot sauce, and the cream. Season with salt, pepper, and lemon juice. 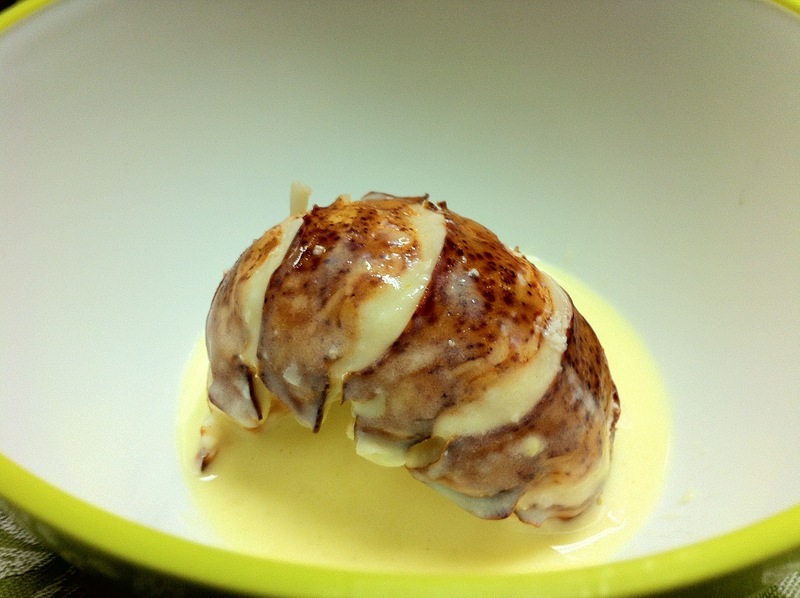 Serve a a lobster tail and two prawns on a bed of rice covered in Thermidor Sauce, and let the romance begin! *Naturally aromatic rice : like jasmin, thai, basmati, arborio, or red rice. Please no Uncle Ben’s plain white, or flavor added mixes. Go for a real rice with an exotic origin and it’s natural warm flavor.